(note: some of this review appeared in our earlier feature on the Indiana Jones: the Complete Adventures Blu-ray). As pretty well everyone who hasn't been living under a rock since 1981 knows, Indiana Jones is the result of a collaboration between George Lucas and Steven Spielberg. 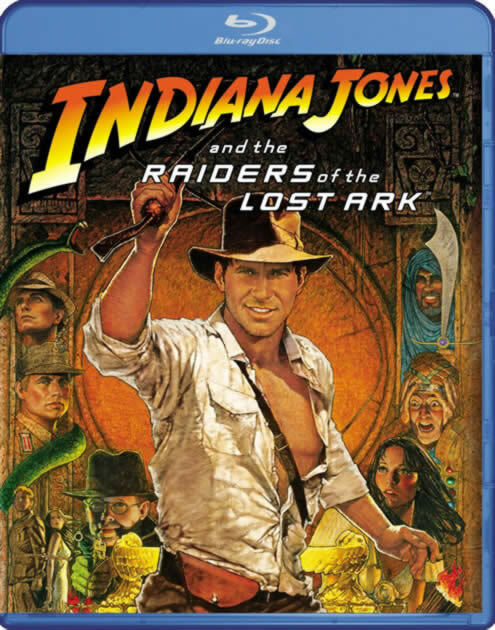 It features Harrison Ford as the two fisted, hand gun and bullwhip-wielding archaeologist whose adventures have pitted him against evil Nazis, evil Thuggees, and evil Commies in his quest to find important historical antiquities that inevitably turn out to have powerful capabilities that give the filmmakers a wonderful excuse for some great special effects sequences. Most people would argue that the first film, Raiders of the Lost Ark, is the best of the bunch, though they've all aged well. But the initial, 1981 movie, which has Indy battling the Nazis and their pet archaeologist for the Ark of the Covenant and takes him through a series of cliffhanger adventures that keep you glued to the edge of your seat. It was a groundbreaking film, an "A-list movie" version of the old "B movie" serials of old – even more so than Lucas' Star Wars movies, which were more a modern telling of the classic fairy tale than a rip-roaring Saturday afternoon serial-type story. Harrison Ford makes a terrific Indiana Jones. He's better here than he was in a lot of his later films, and he's backed up by an excellent cast of good actors including Karen Allen, who was more than just a love interest/damsel in distress, Denholm Elliott and John Rhys Davies. And I can't not mention the brilliant John Williams, whose – including the famous Indy theme that became part of Pop classics – soars with the stories. Since the original boxed set release was probably among the most anticipated Blu-rays, I'm not sure who the target audience for the individual titles is, unless Paramount is hoping to snag some extra sales from people who didn't like all the movies in the series and didn't want to pay extra for the whole series. For whatever reason, Paramount is releasing the titles individually, and that's good. We received the first - Raiders of the Lost Ark (now renamed "Indiana Jones and the Raiders of the Lost Ark," undoubtedly for consistency across the series - and even though it's the oldest of the films Paramount has done it justice. Mostly, anyway. The film(s) supposedly received a painstaking remastering for the initial BD release, but this one was apparently given a special restoration, perhaps because it needed it the most. And even though it does tend to show its age a tad, the 1080/24p picture looks great overall. Colors are wonderful, the blacks are deep and give real depth in places, and the image is mostly nice and sharp. There are plenty of flaws if you look, including quite a bit of softness in places, but this is still the best video version of the movie yet. The audio is surprisingly good, enveloping you nicely in the action – and there's even decent low frequency effects for such an old film. Crank it and louder passages (for instance, the climactic Nazi kill-a-thon when God wreaks his anger on them) can be a bit shrill, but as with the video, this is still the best version yet. The Blu-ray seems identical to the boxed set version and that means you don't get the extras the set included on a separate disc. That's a shame, though you can still get the boxed set if you're looking for all that stuff. As it sits with this new Raiders release, however, all you get is a couple of trailers - though to be fair, there is an HD digital copy included as well, and that's a nice bonus. So while this appears to be a straightforward porting over of the original Blu-ray release, if you don't mind losing the documentaries - and three other movies - this is still a pretty fine title.